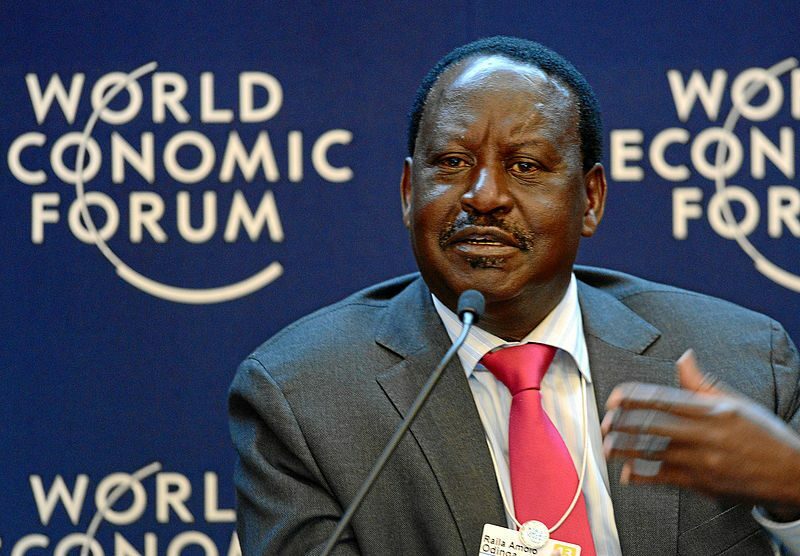 When Kenyan opposition leader Raila Odinga was symbolically — if not legally — sworn in as the “people's president” on January 30, three major broadcasting networks were unplugged by the Government of Kenya. Uhuru Kenyatta was sworn in for a second term as president on November 28, 2017 after winning a controversial re-run election, which was held in October 2017 after the country's Supreme Court annulled the results of the initial August 2017 vote, having found “irregularities and illegalities”. Raila Odinga did not participate in re-run, arguing that systemic flaws that produced these irregularities had not been addressed. The elections were marked with protests, multiple incidents of violence and destruction of property. After months of uncertainty, incumbent president Uhuru Kenyatta remains in power. But supporters of Raila Odinga remain committed to his campaign and cause. On January 30, 2018, thousands of Kenyans flocked to the famous Uhuru Park to witness a symbolic swearing-in ceremony for Raila Odinga of the National Super Alliance (NASA). The majority of attendees were mainly people from Western, Nyanza, Coast and Eastern parts of Kenya where NASA enjoys sizable support. Some Kenyans did not go to work and decided they were going to watch this historic event from the comfort and safety of their homes. To their disappointment, the government decided to disconnect all the major broadcasting stations in the country including KTN News, Citizen TV and Inooro TV (both owned by Royal Media Services) and NTV, preventing them from effectively airing live coverage of the event. According to Kenya's Attorney general, the mock ceremony was “treasonous” and therefore, in their view, had no place on national television. The Committee to Protect Journalists reported that President Kenyatta and other executive staff “summoned media managers and editors on January 26 and threatened to shut their stations down and revoke their licenses” if they proceeded with the broadcast. ‘People's president’ or ‘treasonous’ swearing in? While Odinga indeed does not hold the office of the President in Kenya, the ceremony at hand was more than just a show of support for Odinga and the NASA. It came as the result of the People's Assemblies Bill, a motion tabled in all opposition-controlled counties that legalized “the formation of the people's assemblies in the devolved units”. The People’s Assemblies bill has been passed by at least 20 county governments out of 47. According to the People’s Assemblies bill, the power is vested in the people and their assemblies will have the power to recognize a leader of their choice. Though this move by a select number of counties was perceived to be unconstitutional, it received substantial national support. The law also allows anybody of the capacity of a high court judge to administer the oath. The swearing in ceremony of Mr. Odinga was meant to be held in 2017, but it was delayed due to a deep divide between Odinga and his core principals. In the January 30 swearing-in ceremony, Mr. Odinga’s running mate, Stephen Kalonzo Musyoka and other NASA core principles, Musalia Mudavadi and Moses Wetangula, did not turn up to the historic event. This kept Odinga waiting for too long, and infuriated the highly-charged crowd. On the other side, the ruling government insisted that the move is unconstitutional and warned that it is treasonous and “a mockery” to take oath of office when there is a legitimate government in place. The Cabinet Secretary, Fred Matiang'i, threatened that those who engaged in the exercise would be arrested and charged in a court of law. True to his words, the member of parliament for Ruaraka T.J Ojwanng who led the “swearing-in” was arrested on 31 January 2018 in a local restaurant in the city. 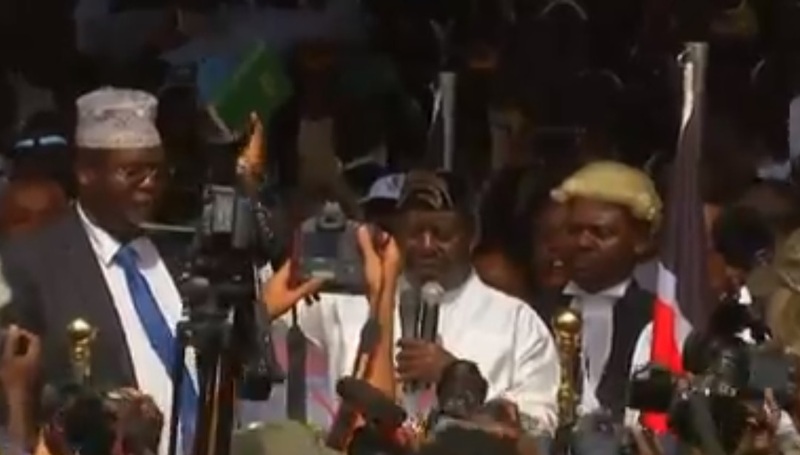 Contrary to the popular view that blood would be shed, the symbolic swearing-in exercise was peaceful. The police kept away from Uhuru Park where the ceremony took place. This was a strategic move by the government as they knew that if the police were present in the venue, this would have provoked confrontation between the NASA supporters and the police. This could have resulted in major casualties. Three journalists at NTV told Reuters that plainclothes security officers came to their office and hovered outside the entrance, leaving the three fearful that they would be arrested if they tried to exit the building. The journalists — Linus Kaikai, Larry Madowo and Ken Mijungu — reported that security sources had warned that they'd be arrested. Linua Kaikai is the managing editor for NTV, and also serves as the chair of Kenya's Editors’ Guild. The media council is shocked that at the recent turn of events in Kenya, a political contest has turned out into the greatest threat and assault on freedom of expression… While it was initially alleged that the switch off was to stop media houses from airing live the swearing in of Raila Odinga, more than 24 hours their signals have not been restored and no explanation put forward as to when they will be allowed to resume operations. On February 1, Kenya's High Court suspended the shutdown of the affected stations. The government has, however, defied the court order. According to the New York Times, a spokesman for the ministry of interior suggested that the government could appeal its case, since relevant representatives were not in court at the time of the suspension order. The persecution of the press in Kenya is a sad reminder of the authoritarian rule that once characterized that East African country under the civilian dictatorship of President Arab Moi. The Jubilee administration doesn't need another battlefront given the legitimacy questions leftover by [the] contentious 2017 election, and it is unclear from a purely instrumentalist perspective why they would open one up. By responding with so much force, the administration unwittingly signalled that the NASA event rattled them even while the actual “inauguration” was rather anticlimactic. Odinga was only on stage for about 15 minutes. None of the other NASA principles turned up. For most of the morning, viewers were treated to panoramic images of the crowd gathering at Uhuru Park and a gaggle of men offering in-studio analysis. Switching off three media houses just because you can is the definition of swatting a fly on your head with a hammer – painful, self-destructive and counterproductive.